The family of Da Costa is probably identical with that of the Mendez da Costa. 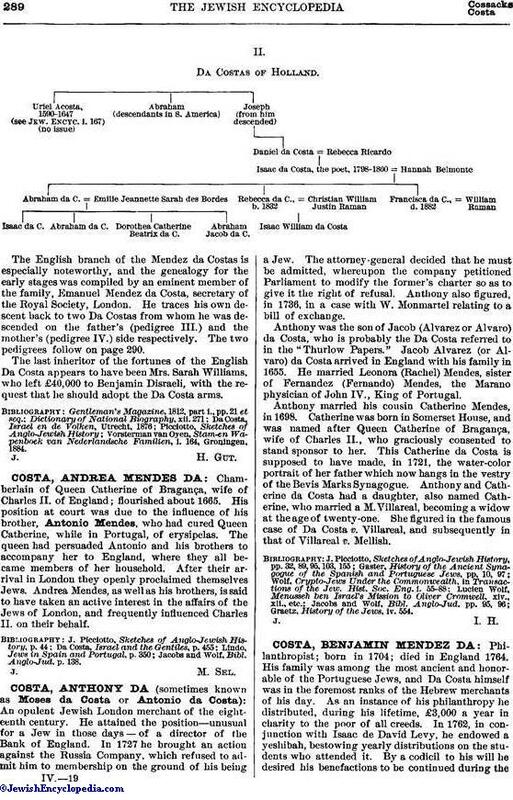 It has even been suggested that an early Mendes called himself Mendez da Costa ("Mendes of the Coast"). The arms of the two families both in England and in Holland are practically identical. I.Mendes Da Costa of the Netherlands II.Da Costas of Holland. 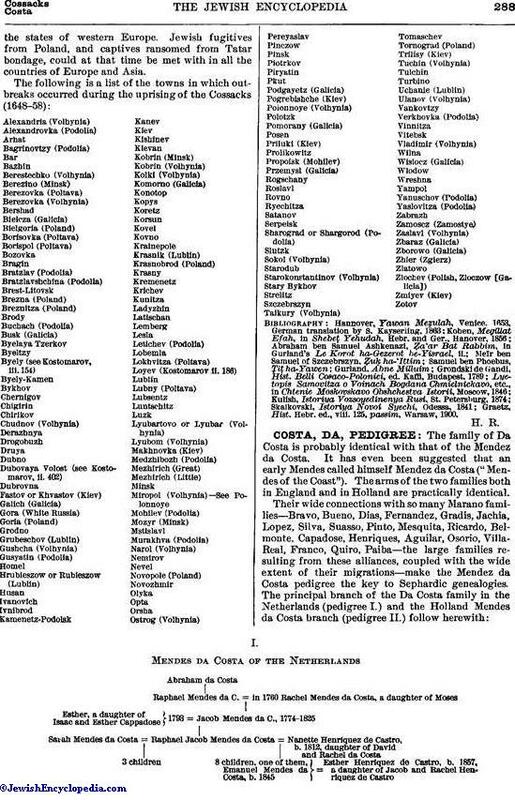 The English branch of the Mendez da Costas is especially noteworthy, and the genealogy for the early stages was compiled by an eminent member of the family, Emanuel Mendez da Costa, secretary of the Royal Society, London. He traces his own descent back to two Da Costas from whom he was descended on the father's (pedigree III.) and the mother's (pedigree IV.) side respectively. The two pedigrees follow on page 290. The last inheritor of the fortunes of the English Da Costa appears to have been Mrs. Sarah Williams, who left £40,000 to Benjamin Disraeli, with the request that he should adopt the Da Costa arms. Vorsterman van Oyen, Stam-en Wapenboek van Nederlandsche Famillen, i. 164, Groningen, 1884.